The latest album by Norwegian black metallers 1349, 'Massive Cauldron of Chaos,' is out now on Season of Mist. Archaon, guitarist for Norwegian black metallers 1349, discusses the band's new full length, 'Demonoir' and how he creates "controlled guitar chaos." 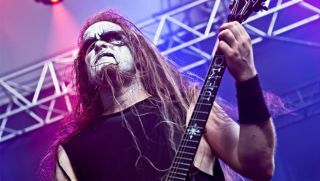 Check out this video riff lesson and question-and-answer interview with Archaon, guitarist for Norwegian black metal act 1349.